Today (11/26/2018) ONLY save 20% on ALL Fenix products with coupon code CMFENIX. No coupon needed for this 1-day only deal from Olight. 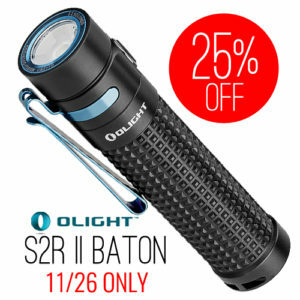 Pick up your Olight S2R II Baton rechargeable flashlight today and save 25%. 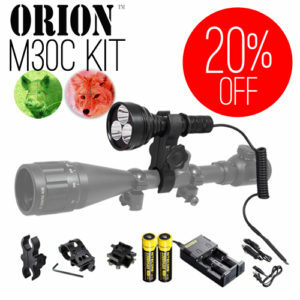 Use coupon code ORION20 at checkout and save 20% on our M30C Hunting Kit in your choice of red or green flashlights. Hurry, this deal ends 11/26/2018! 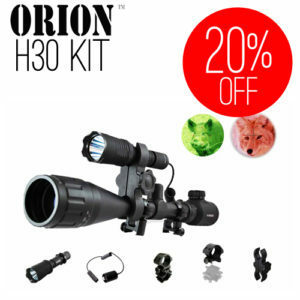 Use coupon code ORION20 at checkout and save 20% on the H30 Hunting Kit in your choice of red or green flashlights. Hurry, this deal ends 11/26/2018!